"It's time to live up to the family name." Wait, what? Is this real? It can't be, this has to be a joke. A trailer has debuted online for a supposed sequel to the classic Australian comedy Crocodile Dundee, released in 1986 starring Paul Hogan. Everyone knows this one, right? 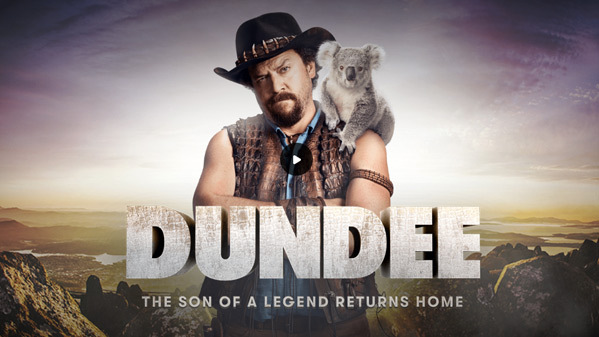 This new film is titled Dundee: The Son of a Legend Returns Home and stars Danny McBride as the new Dundee. Apparently he's the son of the original Dundee? Named Brian Dundee. And he's returning home? This movie appeared out of nowhere and there's no official information available anywhere yet - except for an article from People magazine and an official website with sparse details. Which makes me wonder if this is some elaborate hoax for a new comedy series or TV show or movie or something else that Danny McBride is involved in. My guess is this might be a viral Australia tourism kind of thing, but the trailer is weirdly amusing and worth wathcing below anyway. Crocodile Dundee is back. Well, actually, he’s missing in the Outback. And the only person who might be able to find him is the loudmouthed American son no one knew he had. Introducing Danny McBride as Brian Dundee. The son of a legend is forced to channel his Aussie roots as he embarks on the ultimate adventure down under. We don't know who directed Dundee: The Son of a Legend Returns Home because no other information is available. Visit the official website for a few more details on the movie. "Crocodile Dundee is a film that has stood the test of time," Paul Hogan tells People. "It was a defining moment in my life and one of my proudest accomplishments. Throughout the past few years, I’ve been thinking about how to bring Dundee to a new generation. I’m excited to introduce the new Crocodile Dundee to the world and look forward to sharing more news about those involved very soon." More info is on its way soon. Thoughts?